Monday, 29 August 2011, Day 279/365. Mmm, chocolate. Hard to resist. 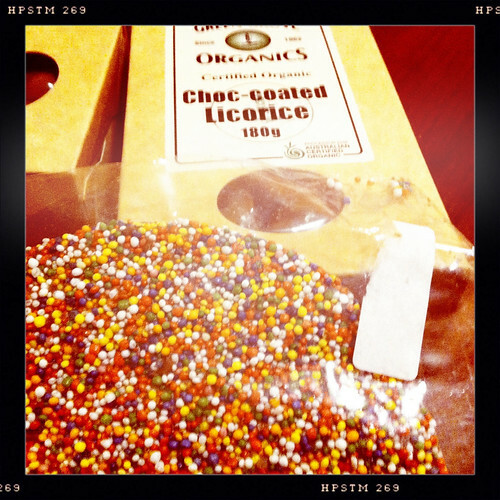 My sister went interstate and mentioned that she’d be stopping by a place that sold organic chocolate and licorice. Without a second thought I handed over some money and told her to buy up. There’s still some rocky road and some chocolate covered licorice left. Sorry to all concerned that I didn’t have a chance to share. Jen, you are possibly not aware that there is a strong statistical link between the eating of chocolate and getting a migraine. I expect that you’ve done all the proper librainly things and looked up migraines on t’internet. best time I found to test out the food-related triggers was on a Friday lunchtime (weekend to recover). There’s also a lot of evidence for household cleaners, or rather the chemicals in them, being a trigger. Febreze (brand name of a fabric refresher) comes up a lot as do some air freshener products with strong smells. Good luck with tracking down your sources. Hazel, I’d thought of chocolate too and while this was a new type for me I’ve not had problems with chocolate before. I’ve also had some since so I don’t think it’s that. I couldn’t think of anything else that may have triggered it. I tend to steer clear of chemicals so I don’t think it’s that either. I wonder if it was hormonal? Hormones? Depends to some degree on your age. Can you get hormone levels checked?